A fantasy campaign without bloodthirsty monsters is like a picnic with bloodthirsty monsters. It's just no fun! 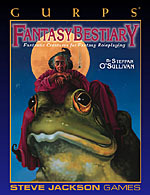 Fortunately, GURPS Classic: Fantasy Bestiary is here to help. With over 250 fantasy beasts and plants based on folklore and legends, this volume can add "run for your life" excitement to any fantastic-minded campaign. Everything has stats for GURPS Third Edition, and the meticulously researched lore and insightful ideas should prove inspirational for any campaign. Make no mistake: GURPS Classic: Fantasy Bestiary will surely spice up your magically minded world, and it definitely won't be a picnic for the heroes. Unless, of course, their picnics are routinely disrupted by giant owls, gullet snakes, manticores . . .